Profile by Vicki Stittleburg: Male and female Carolina Wrens look alike; both are reddish-brown above and warm buffy-orange below, with a long, slightly downcurved bill, a bold white eyebrow stripe, a rusty cheek, white throat, and a relatively long tail. Carolina Wrens are common in Houston and the eastern part of Texas. They can be found in dense forest undergrowth, especially in shrubby tangles and thickets. They usually forage in pairs, creeping around vegetated areas and scooting up and down tree trunks in search of insects, spiders, and fruit. They will visit bird feeders for seed, peanuts, and suet. Often heard before they are seen, this small, shy bird produces a loud song. The adults live in pairs all year, and they may "duet" at any season, with the female giving a chattering note while the male sings ringing variations of tea-kettle-tea-kettle-tea kettle. 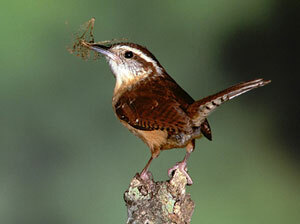 Keeping a brush pile is a great way to attract Carolina Wrens to your yard. Keeping a brush pile is a great way to attract Carolina Wrens. They eat predominantly insects and readily visit suet feeders. Males build nests in various locations to attract a mate. Once he has attracted a female, she usually proceeds to build her own nest, ignoring all his attempts. Sometimes Carolina Wrens use nest boxes, but they often prefer eave overhangs and more unusual spots, particularly hanging baskets.